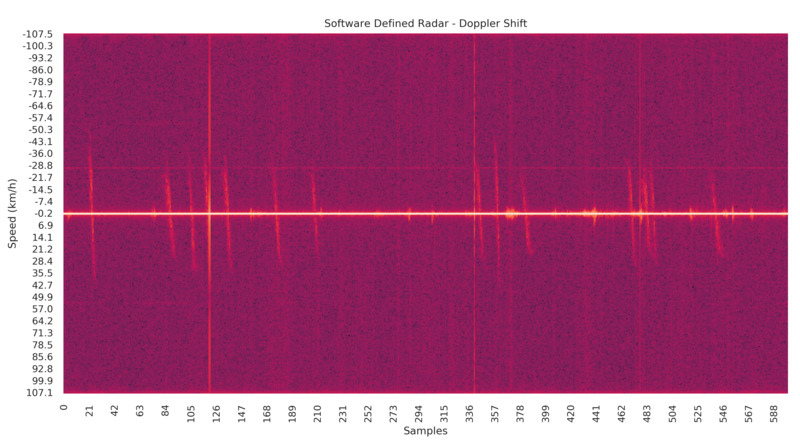 Thanks to Luigi (aka @luigifcruz and PU2SPY) for writing in and submitting to us his LimeSDR based doppler radar blog post. The LimeSDR Mini is a low cost two port TX and RX capable SDR. Luigi's doppler based radar makes use of one TX port to transmit the radar signal, and the RX port to receive the reflection. The idea is that the if the object being measured is moving, the received reflected signal will be altered in phase due to the doppler effect. 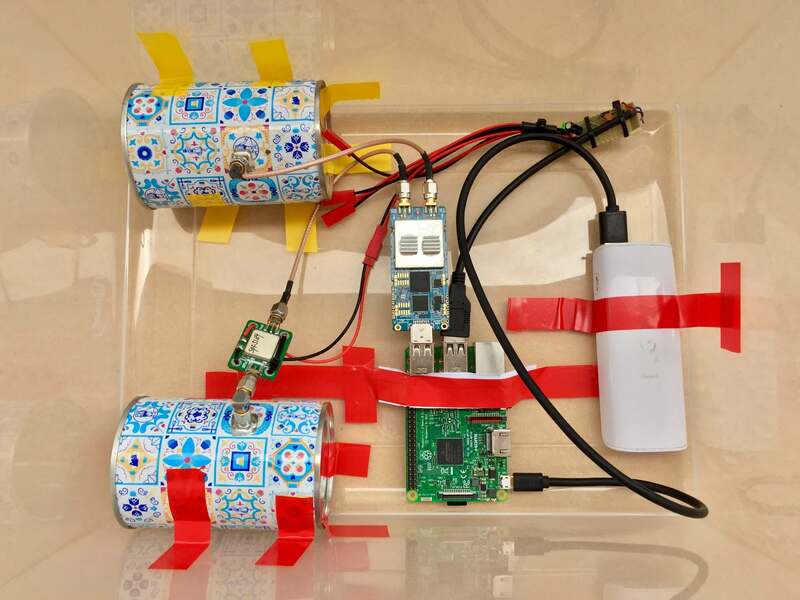 In terms of hardware, Luigi's radar uses the LimeSDR Mini as the TX/RX radio, a Raspberry Pi 3 as the computing hardware, an SPF5189Z based LNA on the RX side, and two cantenna antennas. It transmits a continuous wave signal at 2.4 GHz. On the software side it uses a GNU Radio program to transmit, receive and process the returned signal. Luigi's post goes over the DSP concepts in greater detail, but the basic idea is to measure the phase shift between the transmitted and reflected signal via a Multiply Conjugate block, and then decimate the output to increase the resolution. The result is then output on a frequency domain waterfall graph. The GNU Radio is all open source and available on Luigi's Github. In order to test the system Luigi first set up a test to measure an electric fan's blade speed. The result was clearly visible line in the spectrogram which moved depending on the speed setting that the fan was set to. In his second test Luigi measures the speed of vehicles by placing the radar on the sidewalk, pointed at cars. The result was clear indication of the vehicle passes as shown by the longer vertical lines on the graph below. The smaller lines have been attributed to pedestrians passing by. LimeSDR Vehicle Doppler Radar Results: Each long line indicates a vehicle, and shorter lines indicate pedestrians. In a third test, Luigi measured vehicle speeds in tougher conditions, with the radar placed 50 meters away from the highway, at 45 degrees, and with weeds in the way. The radar still generated obvious lines indicating vehicles passes. Finally, in his fourth test, Luigi tested the speed accuracy of his radar by measuring a car driving at a known speed. The results showed excellent accuracy.